The Flood, originally published in 1880, is a riveting novella by Emile Zola. It tells the story of Louis Roubien, a prosperous farmer who lives a blissful existence with his siblings, son, grandchildren, and great-grandchildren on a fruitful patch of land near Toulouse. The family is enjoying a typically pleasant evening, sharing a hearty meal and singing songs, when a scream from outside the house shatters their peace. The men rush out to meet some neighbors fleeing to higher ground, rushing to escape the Garonne River, which has overflowed its banks and is rising steadily. While only moments before Louis’s life was the epitome of happiness, now his home, farm, and family are threatened by the relentlessly advancing waters. Zola manages to pack all the excitement and suspense of a 21st-century action film into this 19th-century novella. As is characteristic of Zola, his description of the natural disaster is incredibly vivid. The reader is totally consumed by the harsh reality of the catastrophe. The story is told in the first person, which is unusual for Zola. There are moments when Louis, the narrator, questions if this flood is a punishment from God or a retribution for the prosperity he has enjoyed. In Romantic literature, that would certainly be the case. The hero’s tragic downfall would come about as the result of some flaw in his character, such as pride, greed, or sloth. In The Flood, however, Louis and his family are guilty of no such sin. As far as the reader is aware, they are nothing but innocent victims of nature’s indiscriminate wrath. This is emblematic of the Naturalist school of literature, of which Zola was the leader. He takes a less sentimental and more scientific view of the universe than his literary predecessors by asserting that nature is going to act according to its own laws, regardless of human desires, thoughts, or feelings. Just as death is inevitable, nothing created by man is indestructible when confronted with the raw power of nature. Though Louis Roubien, a good Christian, is telling the story, the world he inhabits is the creation of Zola, the stoic Atheist. The Flood delivers intense moments of edge-of-your-seat thrills interspersed with scenes of heartbreaking tragedy. Whether you are a fan of Zola or not, you can’t help but be deeply moved by the plight of the Roubien family. In fact, if you have never read Zola’s writing before, this would be a good introduction to his work. It is a relatively brief piece, yet it is very similar in style to some of his best novels. In about an hour’s worth of reading, The Flood generates much of the same emotional power one finds in Zola’s masterpieces like Germinal and La Terre. Despite its brevity, this is no minor work in the Zola canon. It deserves to be read by all. Though little known south of the border, Tom Thomson and the Group of Seven are widely considered Canada’s greatest visual artists. 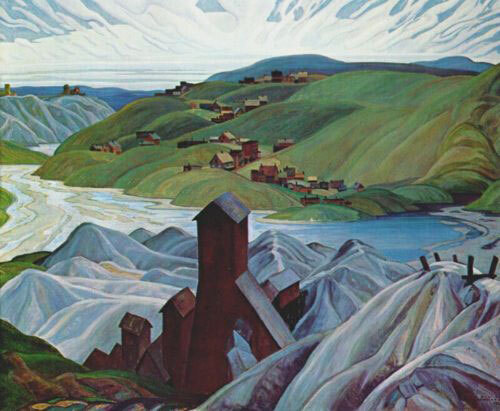 Through their idiosyncratic blend of impressionism and fauvism, they produced stunning depictions of Canada’s northern landscape and founded a uniquely Canadian school of art. Northern Lights provides a gorgeous overview of their illustrious careers. This is first and foremost a coffee-table book, not a scholarly monograph nor an in-depth art historical treatise. The introductory essay is only five pages long. 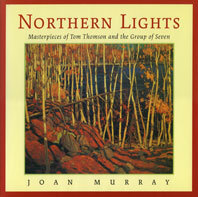 In it Joan Murray provides a nutshell summary of the Group of Seven for newcomers, while sprinkling it with enough new material not to bore the tears out of those already familiar with the plethora of existing books on the subject (many written by Murray herself). In compensation for the brief opener, the bulk of the book’s text appears interspersed throughout the gallery of 118 color plates. Each pictured work is accompanied by a paragraph or few offering valuable context as to where, how, and why each painting was created. In general these entries are quite informative, though at times Murray has a tendency toward excessive psychological speculation, as in “The artist must have been thinking [insert thought here] as he was painting this.” Really, must he? The works pictured here for the most part represent a “greatest hits” collection of the Group’s most famous paintings. You won’t find much in the way of unusual departures, like Johnston’s airplanes or Harris’s Kandinskyesque abstractions. The masterpieces are arranged roughly in chronological order. Whenever possible, preliminary sketches are pictured alongside completed canvases, so you really get a good idea of the process behind the creation of these landmark paintings. Like many books on the Group of Seven, it stresses the work of the higher-profile “senior” members—Tom Thomson, Lawren Harris, J.E.H. MacDonald, A.Y. 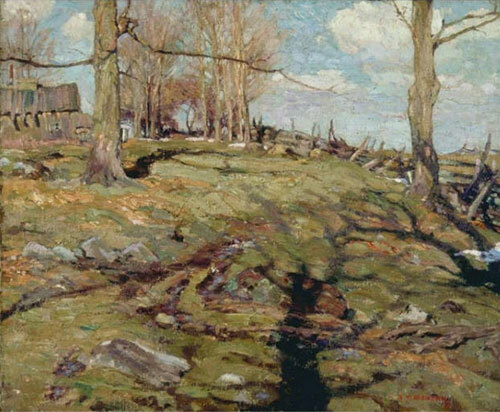 Jackson, and Arthur Lismer—at the expense of the remaining “junior” members of the movement. I really like the work of some of the less-appreciated masters—Franklin Carmichael, Frank Johnston, A.J. Casson, and Edward Holgate in particular—so their scant representation here is a disappointment. I can’t deny, however, that this is a fabulous collection of artwork reproduced beautifully in an elegantly designed package. Among the many Group of Seven books I’ve seen, I would rank this one second only to the mammoth volume by David P. Silcox that came out in 2006. Whether you’re a Canadian who grew up amidst such masterpieces, or a foreigner who discovered them later in life (like me), Northern Lights will make a beloved addition to your art library. 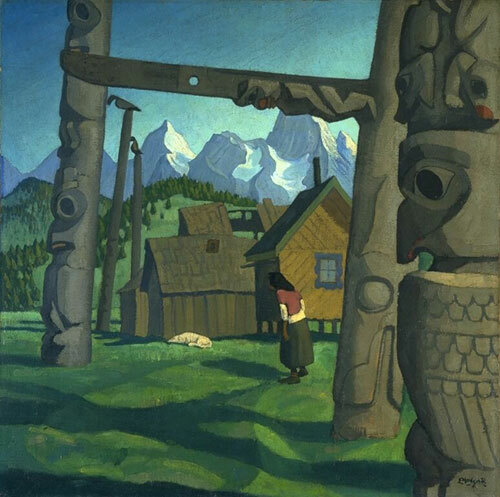 A. Y. Jackson, The Edge of the Maple Wood, 1910, oil on canvas, 25.75 x 21.5"
Franklin Carmichael, Northern Silver Mine, 1930, oil on canvas, 47.75 x 40"
Edwin Holgate, Totem Poles, Gitsegiuklas, 1927, oil on canvas, 31.875 x 31.75"
Smoke Bellew is a collection of short stories by Jack London. Each of the twelve stories is an adventure in the life of the title character, so though each functions as a self-contained tale, they are meant to be read sequentially. For reasons unknown, many of the e-book and online versions of Smoke Bellew only contain six of the twelve stories, so make sure you’re getting a version with all twelve stories before you download. Christopher “Kit” Bellew, a moderately wealthy man of leisure and reluctant newspaper columnist, is scolded by his uncle for being a useless ninny. He is persuaded through such badgering to accompany this uncle and cousins on a gold hunting expedition to the Klondike. After packing tons of gear over Chilcoot Pass, Kit discovers he likes the rugged outdoor life and decides to stay in the North for good. Through a series of adventures the reader witnesses his transformation from green tenderfoot to grizzled sourdough. Eventually his speed at traversing the frozen trails earns him the nickname of Smoke, which he adopts as a badge of honor. As a protagonist, Smoke leaves a lot to be desired. In the first couple of stories, when he’s still a big-city dandy, he is incredibly annoying. He speaks in cheesy bohemian slang, even repeatedly referring to his uncle as “avuncular.” Once he starts to discover his inner macho man, he shows an incredible gift for self-congratulation, never missing an opportunity to pause and marvel out loud at what a man he’s become. In the story entitled “The Little Man,” Smoke‘s life is saved by an incredible feat of heroism, yet somehow he ends up taking credit for it in the end. Luckily, as the book goes on, Smoke becomes more and more tolerable, but throughout the collection his sidekick Shorty is a far more sympathetic character than he is. Smoke Bellew was first published in book form in 1912, after the stories had all been previously published in Cosmopolitan magazine. While these stories have not been dumbed down to the point of being adventure tales for teenage boys, there seems to have been a conscious attempt to deliver straight-ahead crowd pleasing entertainment devoid of any of the darker philosophical themes one often finds in London’s stories. Early in his career, London published a number of remarkable collections of Klondike tales, among them The Son of the Wolf, The God of His Fathers, Children of the Frost, and The Faith of Men. The stories in Smoke Bellew feel like familiar plots recycled from those earlier collections, but stripped clean of any mention of survival of the fittest, the inevitability of death, or the brutal indifference of nature towards the lives of men. Only the final story, “Wonder of Woman,” strives to be anything more than good fun. Here London attempts to do what he does best by chronicling an epic journey of survival, yet it still feels like an inferior rehash of better stories previously told. The offerings in Smoke Bellew are good, competently constructed adventure tales, but by no means great. If you’ve never read London’s work, and are looking to dip your toe into his icy waters, no harm will come from wading into this volume. Those familiar with London’s writing, however, know that he is capable of much better work than this. For such readers, Smoke Bellew provides pleasant satisfaction, but for the most part fails to impress. The Darwin Experience is a memorial tribute to the illustrious scientific genius Charles Darwin and his theory of evolution. It was published in 2008 to commemorate the 150th anniversary of his birth. Much attention and painstaking detail has been given to the graphic design of this book. Though not a lengthy work, this little coffee table book comes in its own slipcase. With only 57 pages of text, it is much more a book to be looked at than to be read. Despite the emphasis on packaging, the text is actually pretty good. Scientific historian John Van Wyhe gives a commendable, concise summary of Darwin’s life and career that is accessible to readers with little prior knowledge of Darwin, yet filled with enough lesser-known facts to keep the interest of those already somewhat familiar with Darwin’s writings. In such a small space, Van Wyhe is required to be brutally brief in his summations of The Voyage of the Beagle, On the Origin of Species, and The Descent of Man, but he shines a helpful light on some of the more obscure works and areas of research which may not be familiar even to some of Darwin’s most avid admirers. Each “chapter” of the book is a two-page spread, consisting of an article on a particular period of Darwin’s life or a specific book that he wrote. This is accompanied by two sidebars, usually featuring extended quotes either from Darwin’s work or from someone praising him, along with six or seven illustrations. Unfortunately, all this content is crammed into a package which is terribly overdesigned, and most of the images are poorly reproduced. Although printed on smooth matte paper, each page features a faux background of yellowed, weathered paper. On top of this is often a screened background image of an old engraving. Sometimes on top of that will be a Victorian wallpaper pattern. Then on top of that is the text in tiny six-point type, rendered in a dizzying array of fonts chosen for their antiquated appearance rather than for legibility. Visually, the result is an overindulgent mess. One of the major selling points of this package is the inclusion of a number of facsimile documents. These are reproductions of Darwin’s letters, pages from his journals, maps or illustrations from his books, and other sundry documents such as a Chilean passport or a ticket to his funeral. These are either strategically affixed to or stuffed into pockets in each page. While the idea is a good one, the problem with these facsimile documents is that without exception they are all poorly reproduced. The scans are blurry, like everything else they are printed on a faux weathered background, and for some reason in almost all cases black lines and letters have been replaced by a hazy light gray. Darwin’s handwriting is hard enough to read, but this design treatment renders it almost totally illegible. The faults of this book lie not with its author but with its design and production. The attempt to create a sensational artifact has resulted in the making of a disappointing book. The Darwin Experience begs to be judged on the merits of its bells and whistles, and in that respect it fails. Readers with a true reverence for Darwin may nonetheless find some enjoyment in Van Wyhe’s admirable tribute. By all means, look for a used or remaindered copy, because it’s definitely not worth the full price. The Luck of Roaring Camp and Other Sketches is a collection of short stories and essays by Bret Harte. It was originally published in 1870, though many of the pieces included were previously published in The Overland Monthly, a popular literary periodical edited by Harte. If you do an Amazon search for Harte today, you will find many different collections with “The Luck of Roaring Camp” in the title, but the stories included in those volumes vary widely. This review is based on the contents of the original 1870 edition, which has been duplicated in the 2010 paperback edition by Kessinger Legacy Reprints. The pieces are divided into three sections: Sketches, Stories, and Bohemian Papers. There is no discernible difference between the first two categories, which combined contain twelve short stories. The four pieces included under the heading of Bohemian Papers are all brief essays. The stories take place in the mining camps and rural towns among the mountains and foothills of northern California, with occasional forays into San Francisco or Sacramento. With this collection, Harte lays the foundation for a California literary tradition that would continue with Jack London, Frank Norris, and John Steinbeck. Harte’s mining camp stories are the obvious precursors to London’s tales of the Klondike Gold Rush, while his beautiful, almost painterly descriptions of the California landscape display the nascent qualities of the naturalistic style perfected by Norris. In the title selection, the only female citizen of Roaring Camp dies while giving birth to a baby boy. Since the child’s father is indeterminate, all the miners decide to pitch in and raise the boy as their communal son. “The Outcasts of Poker Flats” tells the tale of four ne’er-do-wells, exiled from the titular town, who unexpectedly find themselves snowed in on their way to the next village. “Brown of Calaveras” and “Tennessee’s Partner” both depict the uncommon friendships that form between gamblers and thieves. In these moments of brilliance, Harte vividly captures the rustic local color of these wild western towns and populates his tales with a lovable assortment of lowlifes, yet he relates it all through the wryly humorous narrative voice of a refined and distinguished man of letters. Unfortunately, all too often Harte seems hell-bent on distinguishing himself as the Nathaniel Hawthorne of the West by offering narratives with too much description and not enough story. He delights in using three adjective clauses for every noun and often seems far more interested in crafting a clever turn of phrase than in telling a satisfying story. The longest story in the book, “Mliss,” details the education of a rough-and-tumble orphan girl who seeks out the tutelage of a local schoolmaster. Harte spends so much time enumerating mildly humorous instances of her quaintly uncouth behavior that the story barely moves forward until its final pages. “Miggles” depicts a quirky character living in a quirky situation, as if quirkiness were enough to compensate for a thin plot. “A Lonely Ride” offers the rambling ruminations of the solitary occupant of a stagecoach on a moonlit ride. Besides the occasional chuckle, there’s little point to it. Harte’s influence on American literature is undeniable. Though born in New York, he was instrumental in establishing San Francisco as a literary center, one that would eventually spawn the three illustrious writers named above. Nevertheless, Harte’s writing may be too antiquated to satisfy today’s reader. If you are a fan of London and Norris, it’s a safe bet you’ll find something to like in Harte’s stories, but it’s unlikely you’ll find yourself bowled over by them. Essential Wolverine, Volume 1 by Chris Claremont, et al. Back in the early ’90s I used to collect the Wolverine series from Marvel Comics, but these early issues were a little before my time, so it’s great to finally get my hands on them in this collection. The Wolverine solo series was always a little bit different from most Marvel Comics in that it was more like a detective or spy series where some of the characters just happened to have super powers. While in the X-Men comics Logan would travel through time and space fighting alien races, in his own magazine he was usually firmly grounded here on earth, roughing up low-life thieves and killers. This collection reproduces issues 1 to 24 of the Wolverine series in black and white. It features some of the best artists who worked for Marvel back in those days. John Buscema’s art (issues 1-8 and 10-16) comes across beautifully in black and white, resembling something out of the glory days of newspaper comics, like the work of Milton Caniff or Roy Crane. John Byrne (issues 17-23) is another excellent Marvel artist, though his work does suffer a little here from the lack of color. Gene Colan also illustrates one issue (#9). Veteran inkers Al Williamson, Bill Sienkiewicz, and Klaus Janson each contribute their own unique skills to the finished art. The writing overall is very good, but there’s nothing here that’s going to go down in history as an iconic story in the Marvel mythology. Chris Claremont (issues 1-8 and 10), sets the foundation for the series by establishing Logan in Madripoor, a seamy, crime-ridden island city-state somewhere in southeast Asia. The Wolverine that Claremont presents here is a lot like Humphrey Bogart’s Rick in Casablanca. By offering well-intentioned assistance to a motley crew of supporting characters, he finds himself continually confronted by danger and intrigue. Peter David’s run on the series (issues 9 and 11-16) is less successful. His six-issue “Gehenna Stone” story is basically a long, slapstick chase sequence punctuated by frequent fist fights. The collection finishes off strong, however, with an excellent seven-issue adventure by Archie Goodwin, drawn by Byrne (issues 17-23). In issue #10, we are introduced to Wolverine’s love, Silver Fox, and her murder at the hands of Sabretooth. This story line was featured in the 2009 Wolverine movie, in a much altered form. Here it’s just a one-shot story, with little indication of the importance these events would play in Wolverine’s future adventures. In later issues writer Larry Hama and artist Marc Silvestri would further develop the Sabretooth/Silver Fox backstory. In their hands Wolverine becomes a sort of Jason Bourne figure, uncovering repressed memories of his paramilitary past. The Hama/Silvestri stories are collected in volumes 2 and 3 of The Essential Wolverine, and I think they’re superior to what’s included here in volume 1. Still, there’s obviously some value to starting at the beginning, and those who enjoy the inimitable character of Wolverine will find much to appreciate in this worthwhile collection of comic art. This collection of essays by Frank Norris, best know as the author of the novels McTeague and The Octopus, was originally published in 1903, a year after his death, having been compiled under the guidance of his widow, Jeanette Black Norris. These 25 essays on literature and the art of writing were originally published in various American literary journals. In these writings Norris pontificates on the state of American literature and his hopes for the future development of the art form of the novel. As a novelist, Norris was a disciple of Emile Zola, and an ardent proponent of the school of Naturalism. Among American writers, he praises few but singles out William Dean Howells and Bret Harte as his favorites. About half of these essays are included in the Library of America’s volume on Frank Norris, simply entitled Novels and Essays, which is what directed me toward this book. That volume from the LOA contains the best of these pieces, and by best I mean the ones that have aged well over the past century and are still relevant to the literary issues of today. A few of the essays included in this volume are not so timeless, for example one piece advises the aspiring novelist of the early twentieth century on how to submit a manuscript, while another asserts that women make great novelists because they are born with sensitive natures, and their occupation as housewives leaves them hours of free time in which to practice their craft. Despite those few antiquated exceptions, overall these are still excellent, thought-provoking essays. Norris’s voice is crystal clear and his arguments immediately engaging. Amid all the intellectual discourse he frequently displays an amusing acerbic wit. The primary thrust of these writings is to call for higher standards in literature and to impel American novelists to infuse their works with the “ring of truth” so fundamental to the doctrine of Naturalism. Norris was no elitist of the literary aristocracy, however. He calls for the democratization of literature, and asserts that if a novel doesn’t appeal to the common man it is worthless. The points he makes reflect current debates over the merits of “literary” fiction versus “popular” fiction—while one side questions whether Harry Potter is great literature, the other side counters by saying any book that gets people to read is a great book. Norris’s theory was that an increase in American literacy, by any means, would eventually elevate the quality of the nation’s literature. At the end of this volume there is an extensive bibliography of Norris’s work. Although it’s not complete, it does bring one’s attention to a lot of stories and essays that have slipped through the cracks over the past century. Game for future hunting, perhaps. If you are a fan of Norris’s writing, or have an enthusiasm for American literature of the early twentieth century, you will enjoy this book. If you already have the Library of America volume on Norris, this may be overkill for you, but if you just can’t get enough of Norris’s nonfiction, then by all means track this book down. The Red One is a collection of four stories by Jack London, most of which are very good. The collection is named after the first story, “The Red One,” an excellent piece of old school science fiction along the lines of Jules Verne, H.G. Wells, or Sir Arthur Conan Doyle’s The Lost World. It tells the story of a naturalist lost on the island of Guadalcanal, searching for a mysterious red object worshipped by the island’s natives. It’s incredibly inventive, years ahead of its time, suspenseful, brilliantly told, and one of London’s best stories. Another great adventure story is “Like Argus of the Ancient Times,” about a former California ’49er who, in his seventies, decides to set out for the Klondike for one more chance at striking it rich. While “The Red One” probably deserves a place in London’s top ten stories, “Argus” just might make the top twenty. “The Princess” is about three aged hobos who cross paths and trade stories about their youthful adventures in the South Pacific. It’s another well-told yarn, though it suffers a bit from an anticlimactic ending. The weakest story in the collection is “The Hussy” about a railroad worker’s quest for gold in Ecuador. It’s nothing special. While this is a solid collection of London stories, I have to dock him a point for some of his descriptive passages of the South Sea island “savages.” There’s been much debate about London’s views on race. I usually give him the benefit of the doubt on that subject, as it may be too much to expect political correctness from century-old stories. However, when you compare “The Red One” to Herman Melville’s Typee, for example, the latter proves that even 100 years ago it was possible to write about the natives with a great deal more respect and tact than London displays here.